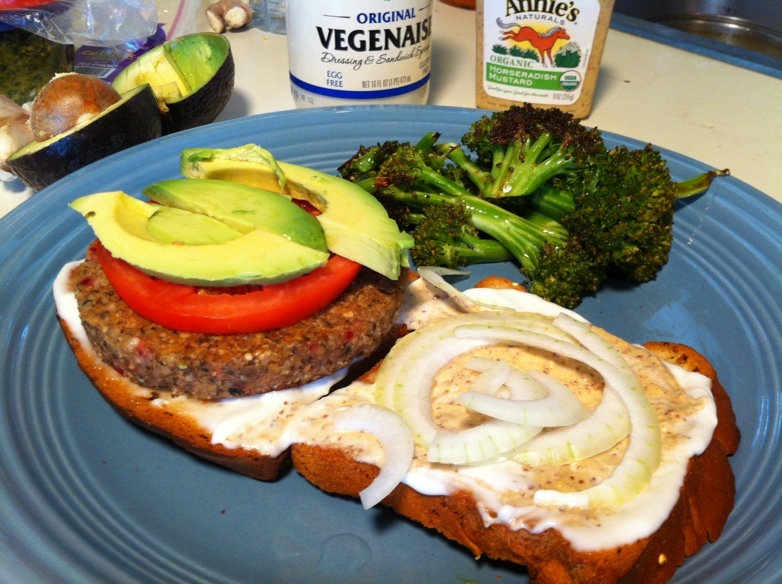 Being a 99% plant-based eater, when I crave a burger, my first thought is to find a good veggie burger. Some of the best burgers I’ve had were veggie burgers, in fact. I have generally found meat-based burgers to not only be nutritionally inferior, but bland as heck. And sadly, the top national brands of veggie burgers are generally highly processed and often contain gluten or isolated soy protein. Enter Good Seed burgers. Good Seed is an Austin company with a superfoods focus. What are superfoods, you ask? Well, superfoods are natural foods with greater than normal nutritive properties. Examples are chia seeds, sea vegetables, beets, and hemp seeds. Superfoods are packed with protein, vitamins, minerals, and various phytochemicals. Note – there are no meats considered to be a superfood. 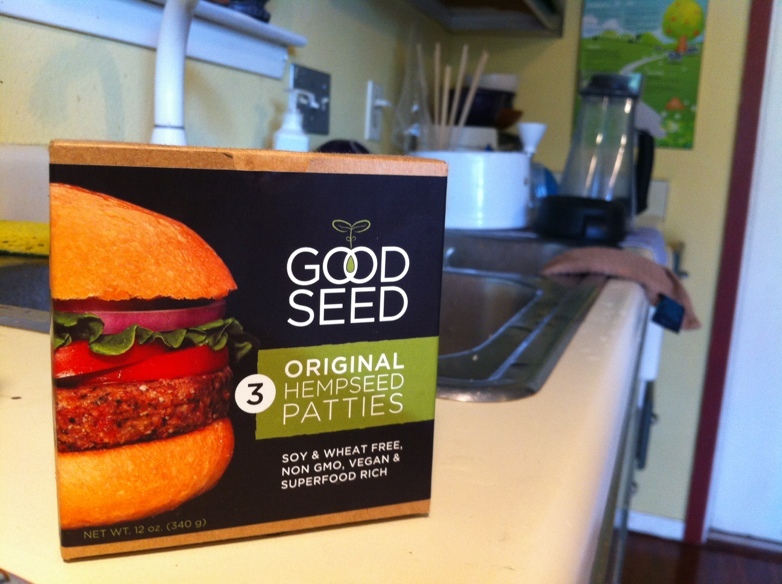 The creator of Good Seed burgers studied at The Natural Epicurean Academy of Culinary Arts years ago, so there’s a connection with my culinary school, which is cool. Just kind my grandmother used to do, I like to use regular sandwich bread on my burgers (gluten free Udi’s or Rudi’s are my usual favorites). And just like my grandmother, I cut my burgers on the diagonal because presenting triangles is culinary alchemy – take an ordinary square and cut it into two triangles, and all of a sudden you’ve made something better than what you started with. Try it. 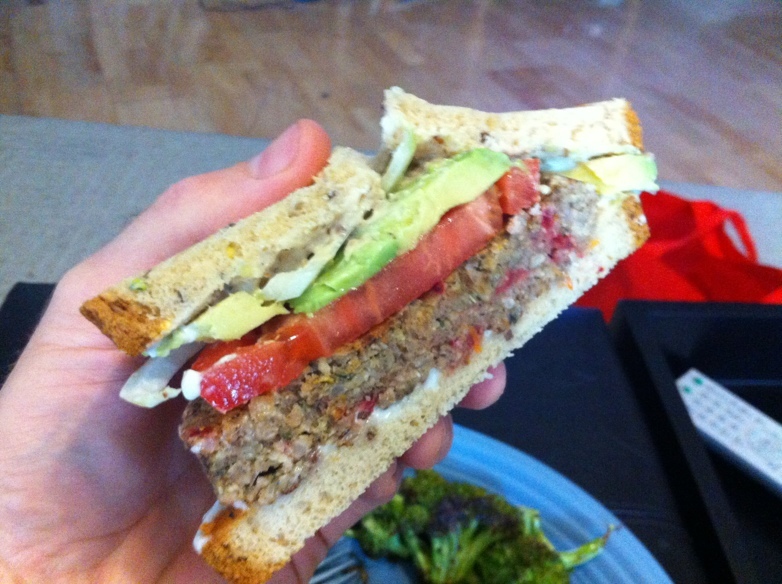 Below: Vegan mayo, thick juicy tomato, crisp toasted gluten free bread, avocado, and a Good Seed burger. Ahhh. And triangles, don’t forget the triangles.